Reading this book was like peeling the petals off of a flower, each petal a little more beautiful than the one before. This novel is a complex family saga surrounded by the beauty of the budding botanical world. We begin with the base born Henry Whittaker who dares to dream and make something of himself. After stealing his way into some wealth, his father’s employer discovers that poor Henry has been robbing him blind. Instead of turning him over to the authorities, he sends Henry on a voyage with the famous explorer Captain Cook. On that voyage Henry learns a great deal about botany and life, and when he returns to England four years later he is rewarded with another voyage, this time to South America. Here is learns more about cultivating plants and exotic botany. After a falling out with his benefactor, Henry ventures out on his own and quickly becomes one of the wealthiest men in America. Henry was blessed with a daughter who inherited his passion for botany, Alma Whittaker is intelligent and has been educated by her plant loving parents. Her knowledge of plants is second to none. When she was young, Henry Whittaker and his wife adopted a young girl, Prudence. Alma and Prudence were complete opposites while both intelligent and raised to be proper ladies, Alma was plain while Prudence was pretty. Though this is a family saga, the author hones in on the story of Alma and follows her throughout her life and is more or less about her journey to self discovery. This is a book about relationships, not just romantic relationships but all the different kinds of relationships one encounters…love, family, sisters, friends, etc. Because of this focus on relationships, throughout the novel we meet a host of interesting secondary characters that develop and enhance Alma’s story by adding contract. Alma was lovable and I think any reader could easily identify with her as a character. I loved that she had such a thirst for knowledge and she wasn’t conventional, she was a bit of a rebel. I loved that she was a strong independent woman. I wanted to know more about her and her life. Gilbert has created a stunning heroine worthy of classic literatures most loved heroines. She was colorful, vibrant, and different. I loved Alma! There were a lot of different themes going on in this novel that were exciting and rich: transcendentalism, scientific development, feminism, sexuality, and of course the development of the botanical field. Pick any of these themes and you were sure to find a rich display of it in this novel. 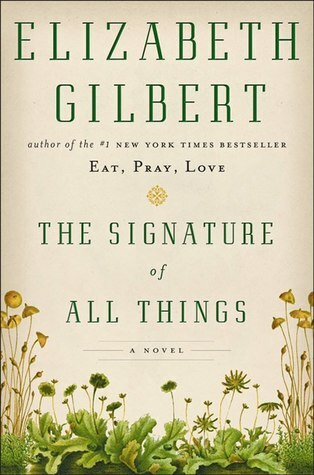 I really enjoyed Gilbert’s writing style. I haven’t read her other books so I wasn’t really sure what to expect with her writing style. I was thrilled that it was so smooth and lyrical. She has a talented way of wording complex ideas so that any reader can understand and see the depth of what’s being said. I loved her storytelling style, absolutely breathtaking and engaging from the first page. I actually feel like I rush through the first part of this novel. I read the first third of the novel quickly because I was anxious to know what happened next and what was to become of Henry and about half was through the novel I wanted to go back and restart it so I could enjoy every word of Gilbert’s story! I also have to give big points to Gilbert for the unique story line. I love family saga’s and I love that this novel was based in botanical science. I don’t know much about botany but I thought it worked well in this story and I found it exciting and refreshing in the plot. The only thing I wasn’t a fan of was I felt like I was being ‘told’ a lot by the author. There was a lot of ‘she did this’, ‘she thought that’ and I felt like I was being told too much rather than being allowed to figure it out for myself. Sometimes it felt a little on the textbook side with all the botanical info….but on the whole it wasn’t overly distracting from the novel and story. This is a novel blooming off the shelves ready to be picked! I’ve been a little hesitant to begin this book, but I believe I will start it after I’m done with the book I’m reading. Great review! I read her other book and enjoyed it (although not quite to the same degree as the whole rest of the world) so I might get around to this one someday.